Expository preaching!? What in the world is that, asked a young junior high student of mine several years ago while I was leading a youth study one Sunday morning on the how-to of personal Bible study. Well, I said, expository preaching is where the pastor teaches through a particular book of the Bible, verse-by-verse, chapter-by-chapter, to expose the meaning of the text in its context. The student seemed to understand but wasn’t sure that was the way he wanted to study the Bible. In today’s sound-bite culture, it would seem that expository preaching has become passé. More and more pastors have acquiesced to church members requesting topical sermons that scratch them where they itch. This is a dangerous trend that has in part led to the current state of shallow Christianity in America. Prior to His ascension, Jesus commanded Peter to “feed my sheep” (John 21:17). Paul, in his letter to Timothy said, “Preach the word! Be ready in season and out of season” (2 Tim. 4:2), and also to be a “workman that accurately handles the word of truth (2 Tim 2:15). Jesus taught that “man shall not live be bread alone, but by every word that proceeds from the mouth of God” (Matt. 4:4). As followers of Christ, we come to church to meet with the living God. His Word must remain central to everything we do and say. Pastors should therefore focus on careful expository preaching in order to “declare the whole counsel of God” (Acts 20:27). It is the Word of God alone that has the power to convict, empower, and transform a human life. 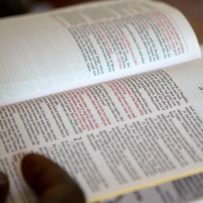 Expository preaching finds its roots with Ezra in the Old Testament with the public reading of the Scriptures and teaching of the law of God to the people. This pattern is followed by the Apostle Paul as he writes to Timothy, “Until I come, give attention to the public reading of Scriptures, to exhortation and teaching” (1 Tim 4:13). This does not mean that the preaching time becomes just a dry running commentary, or academic exercise. Proper and relevant application always needs to be made to the passage under consideration. Haddon Robinson, in his book Biblical Preaching, defines expository preaching as follows, “Expository preaching is the communication of a biblical concept, derived from and transmitted through a historical, grammatical, and literary study of a passage in its context, which the Holy Spirit first applies to the personality and experience of the preacher, then through the preacher, applies to the hearers.”  This means then that the passage under consideration governs the sermon. People often find topical preaching preferable because it may directly address their immediate felt needs, but there are several problems with this approach. Someone can hear a variety of topical sermons such as “Being a Successful Christian,” or “How to Develop a Healthy Marriage,” or “Dealing with Finances,” and never learn the skills to study the Bible on their own. By moving systematically through a book of the Bible people are being taught how to navigate and engage the text on their own. They learn to pay attention to context, word structure, and genres. They will see that God’s Word speaks to a great variety of topics related to everyday life. This is essential in the local church as we seek to equip those under our care to be Bible expositors at home as well. When this is not done, we are communicating a dangerous message that everything revolves around us, the trained professional of the clergy-class. This “me”-centric approach, where we want the Bible to address our needs and our agenda lies in stark contrast to a theocentric method, in which everything revolves around God and what He wants to communicate to us. This is really a matter of authority. When pastor/teachers try to always be cutting-edge, or stand-up comedians, or tell endless stories to fill time, the Word is diminished and everyone is the lesser. God’s Word is sufficient and powerful enough to stand on its own without gimmicks. One of the great benefits of expository preaching is that it forces us as pastors to carefully mine out the message of the passage, whatever that may be, rather than just pick and choose the parts we want to address. Believers need a balanced diet of spiritual food that does not emphasize certain truths to the neglect of others. This is clear in 2 Timothy 3:16-17, “All Scripture is inspired by God and profitable for teaching, for reproof, for correction, for training in righteousness; so that the man of God may be adequate, equipped for every good work” (NASB). Expository preaching is therefore the most biblical method of delivering a sermon. There are several essential components of any expository message that must be taken into consideration in order to properly instruct, reprove, and correct the family of God in their everyday lives. The first of these components is application. Expository preaching is not and should not be a dry, recitation of information for the curious, but it must include relevant application of the text in relation to the complexities of real life. In seminary we were instructed to write the words, “so what” at the completion of our sermon manuscripts. What is the average congregant going to do with what you have just spent the last 40 minutes preaching on? What will they remember an hour from now at the dinner table? The old adage, “information without application yields frustration” is as accurate as ever. Exegetical preaching must point people to the God of the Word and what He is communicating to His people. As pastors our heart’s desire should be for our people to feed on the Word and grow in their relationship with the Lord. This involves intentionally leading them to biblical truth, and allowing the Lord to transform them and us into His image. One of the most helpful pieces of wisdom I was ever given by my mentor was this, “You cannot legislate spirituality; that’s God’s job.” This small statement speaks volumes in terms of our responsibility as pastors to do all we can to present the message and then leave the results to God. We trust that God speaks directly to the human heart through His Word. Expository preaching then helps foster a stronger and broader foundation for people to grow and mature, than would be gained by a topical approach. Another significant benefit of expository preaching in relation to long-term sermon planning is the stability it creates. We, as pastors, know where we will be next week, and the week after. We are then able to meditate on the upcoming passage, allowing it to ruminate in our minds, and thus deliver a Spirit-led, well-thought out message. This can be equally beneficial for the church staff in terms of worship planning, song selection, and other media considerations in a cohesive effort to enhance the particular theme being preached. Interestingly, Dale Burke, former pastor of Fullerton Evangelical Free church, told me that even though he preached exegetically through a particular book of the Bible, he would split the book into various subthemes consisting of three to four weeks each. The book of Ephesians for example, may take four months to complete in total, but was broken down into four or five mini-series, so as to not allow the listener to think the series was “dragging on.” This creative approach may or may not always be necessary or applicable but is an example of creativity within the exegetical preaching framework. In conclusion, expository preaching is essential to the health and strength of the local church. In establishing the centrality and priority of the Word of God, the church grows deeper in their love and understanding of the God of the Word. While there are certainly times when topical sermons are beneficial and even necessary, exegetical preaching should receive the lion share of the church’s precious time together. Haddon W. Robinson, Biblical Preaching: The Development and Delivery of Expository Messages, 2nd ed. (Grand Rapids: Baker Academic 2001), 5. Brian Richard is senior pastor of Grace Baptist Church in Plover, Wis. Brian has a B.A. from the University of Wisconsin, an M.Div. from Liberty University, and is currently pursuing a Doctor of Ministry degree from Dallas Theological Seminary. He lives in Plover, Wis., with his wife, Caryn, and two daughters.